This article is about the song by Jay-Z. For the song by Alicia Keys, see Empire State of Mind (Part II) Broken Down. For the book about Jay-Z's business dealings, see Empire State of Mind (book). "Empire State of Mind" is a song performed by American rapper Jay-Z and featuring vocals by American singer Alicia Keys that was written by Angela Hunte and Jane't Sewell-Ulepic. Produced by Al Shux, Angela Hunte and Jane't Sewell-Ulepic, it was released as the third single from Jay-Z's 11th studio album, The Blueprint 3 (2009), by his Roc Nation label in October 2009. The song was written as a tribute to both artists' hometown, New York City, and features a music sample of "Love on a Two-Way Street" (1970), written by Sylvia Robinson and Bert Keyes and performed by The Moments. The following month they submitted the song to Jay-Z's Roc Nation, whose reviews were a discouragement. Following an incident that Hunte and Sewell-Ulepic describe as an omen, they took the suggestion of an associate of EMI Music Publishing and resubmitted it to Jay-Z, who kept the "New York" singing part on the hook, changed the verses, and recorded it as a single. The single was supposed to feature Hunte on the song's hook, but when Hunte and Sewell-Ulepic were asked if they thought anyone else would be more appropriate for the chorus, Hunte suggested Keys. Mary J. Blige was also considered for the part, but Keys was chosen after Jay-Z heard the song's piano loop. The song was viewed as being an "orchestral rap ballad" and has pop-rap musical styles. It contains references to various locations in New York and its famous residents, while describing the city's essence. Profanity is present throughout the song and, although it is usually included during live performances, it was omitted during the performance at Game 2 of the 2009 World Series. A critical success, the song was included in multiple critics' top 10 list for the best songs of 2009; including Rolling Stone magazine and the New York Times. The song was also nominated for three Grammy Awards, winning Best Rap Song and Best Rap/Sung Collaboration. "Empire State of Mind" achieved commercial success worldwide. The track peaked within the top 10 in countries including the United States, the United Kingdom, Canada, Australia, France, Italy and Sweden. The single was commercially successful in the United States, peaking at number one on the Billboard Hot 100 for five consecutive weeks, becoming Jay-Z's first number-one single on the chart as a lead artist. It appeared in 2009 year-end charts in Italy, Australia and the US, where the song was also the last number one hit of the 2000s. As of June 2014, the single has sold over 5.5 million copies in the United States. In the song's music video, which is primarily in black-and-white, Jay-Z and Keys are shown performing the song in various locations in New York. "Empire State of Mind" has been performed by Jay-Z and Keys multiple times, including during the 2009 MTV Video Music Awards and the 2009 American Music Awards. Usually when the duo performs the song, an overhead screen shows images of places in New York. Keys has recorded a sequel entitled "Empire State of Mind (Part II) Broken Down", which is featured on her fourth studio album The Element of Freedom (2009). Her version was positively received by critics and did well commercially, although it was not as successful as its predecessor. It was, however, Top 10 in the UK, the Netherlands and Ireland. She said that she chose to record her own version of "Empire State of Mind" because she wanted to express her own personal feelings about New York. Hunte and Sewell-Ulepic were inspired to write "Empire State of Mind" based on their everyday life in New York. "Empire State of Mind" was created by singer-songwriter-producer Angela Hunte, a native of Brooklyn, along with writing partner Jane't "Jnay" Sewell-Ulepic. Hunte grew up in the same building where rapper and hip hop artist Jay-Z lived—560 State Street, an address which is mentioned in the song. The track's creation was inspired during an overseas trip Hunte and Sewell-Ulepic made to London in February 2009 when they were both feeling homesick. Hunte was ill during that summer, while Sewell-Ulepic's mother was ill. Hunte recalls, "We said to ourselves, 'we complain so much about New York—about the busy streets, about the crowds and the pushing, about the subway system—but I would trade that for anything right now.' Before we left the hotel that night, we knew we would write a song about our city." Although they wrote the song as a simple way to voice their feelings for their hometown, they sent it to the Roc Nation music label the following month in hope that Jay-Z would like it and record it. When they received negative reviews about the track they were convinced it would never be recorded. However, in the summer of the same year, EMI Music Publishing's (EMI) Jon "Big Jon" Platt heard the track at a barbecue and fell in love with it, believing that "it would be perfect for Jay-Z". Hunte and Sewell-Ulepic were hesitant though, as they had sent the track for consideration already and been unsuccessful. According to Hunte, when a Notorious B.I.G. figure she kept by the computer fell over as they played the track for Platt—a statue that had never moved before regardless of how loud they've blasted music—she realized it was an omen. She commented, "We all just looked at each other like, 'if Biggie approves, then, send it to Jay'". The next day Platt sent it to Jay-Z and he "loved it and recorded it that night". Hunte recalls, "We were just so happy he wanted to honor our work and our production. Two female producers/writers, and for him as a rapper to take our song—that's not a combination you see a lot. For him to be so open-minded about it, we just couldn't be any more grateful and thankful." Originally composed as a song to be sung, Jay-Z ended up rewriting new verses inspired from the original lyrics and leaving Hunte on the song's hook. However, when Hunte and Sewell-Ulepic were asked if they thought someone else would be more appropriate for the chorus, Hunte suggested R&B and soul artist Alicia Keys. Hunte said, "She's never done a record with him and she also has my same vocal tone. She made the song sound so close to the original, She just nailed it and brought it home. It was a great choice." Keys also contributed to writing "Empire State of Mind"'s new bridge. "Obviously, I'm very grateful to him [Jay-Z] for reaching out to me and for that type of ability to represent my hometown, like, that was crazy. So we went to the studio. I went to the studio, and [...] I fell in love [with the song] from the jump." Jay-Z stated in an interview that after he first heard the track's piano loops (which are sampled from "Love on a Two-Way Street" by The Moments), he immediately thought of Keys and wanted her to be featured on the song. Jay-Z said that Mary J. Blige was initially considered for Keys' part on "Empire State of Mind" and admitted that he was "two seconds away" from asking Blige to appear on the record's chorus. His second choice for the track's vocals was Keys and that using Blige on the song would have been a safe move, but said that the combination of Keys' sound and piano talent had struck a chord with him. In December 2009 Hunte, who would not reveal many details, said the original version of "Empire State of Mind" will one day be released, adding that "The original is so powerful it's only a matter of time till you hear it down the line". A sample of "Empire State of Mind" featuring Jay-Z rapping the last part of the second verse, and Alicia Keys singing the chorus. Jayson Rodriguez of MTV News felt that Keys "crooned" the lyrics to the song's hook. "Empire State of Mind" features rap verses from Jay-Z and vocals during the song's chorus from Keys. It is a rap hip hop song with influences of electropop and orchestral pop. The track also has pop-rap musical styles and contains a music sample of the 1970 Billboard R&B chart-topping single "Love on a Two-Way Street" by The Moments, the sample being the piano component that runs throughout the song. The song is played at a moderate tempo of 84 beats per minute and is written in the key of F# major. It has a sequence of F♯–C♯/B–B–F♯ as its chord progression, throughout the single Keys' vocal range changes from the register of A♯3 to C♯5. Pete Cashmore of NME described Keys as having established "crashing piano chords" during her verses in the track. Mariel Concepcion of Billboard magazine noted that the track has a "simple piano pattern". Stephen Dalton of The Times described the song as an "orchestral rap ballad". Lyrically, the single opens with lyrics referencing locations in New York, it name-checks notable neighborhoods and captures the city's essence; from attending Knicks basketball games to its famous residents. Drug dealing references, "N-words", and profanity are also present throughout the song. Raju Mudhar of the Toronto Star commented on the track's lyrics "I'm the new Sinatra/And since I made it here/I can make it anywhere/Yeah they love me everywhere" remarking "who can argue?" noting that he's "one of those waffling retirees", but is a living "hip hop legend". Jayson Rodriguez of MTV News felt that Keys "croons" on the track's chorus line, "I'm from Neeeeww Yooooork/These streets will make you feel brand-new/Bright lights will inspire you." Keys said that while recording the song she wanted to make sure she got the hook right explaining, "I did try it a couple of times, but it was more about capturing the kind of grand feeling of it. With the way I sang it the first time, I was actually kind of sick, and I knew that he needed the record, so I was like, 'Let me get to it.'" She added, "I came back and revisited it so that it could be what it is now[.] So it actually took a couple of times, but every time, the energy was just so high." Simon Vozick-Levinson of Entertainment Weekly felt that the singer who sings the song's hook has a "crucial role", believing that "Empire State of Mind" is a "smash that concert attendees expect Jay to play, and it just wouldn't work without a big, clear voice to sing that hook". In November 2012, Keys said she had to redo the vocals after Jay-Z said he wasn't happy with her original take. Keys said she had been battling "nasal congestion" when she did the first take. Music critics commended Alicia Keys for her chorus line. "Empire State of Mind" received acclaim from contemporary music critics, with most reviewers praising Keys' vocal performance. Jon Bush of Allmusic listed the song as being a highlight from The Blueprint 3. He commented that the song is Jay-Z's "king of crossovers ... a New York flag-waver with plenty of landmark name-dropping that turns into a great anthem with help on the chorus from Alicia Keys". Los Angeles Times writer Greg Kot commended Jay-Z for his ability to perform with cameos and called the song "the sound of Jay-Z cruising for pop hits." Pete Cashmore of NME described Alicia Keys's cameo as "lusty bellowing". Martin Andrew of PopMatters called the song "yet another chance" for Jay-Z to show his respect to New York, but commented that it "remains interesting thanks to a fantastic Al Shux beat and celebratory hook from Alicia Keys." Writing in Rolling Stone magazine, Jody Rosen called it a "pallid New York shout-out". USA Today's Steve Jones perceived a maturity by Jay-Z in the song, writing that "The upper-crust landmarks he now references are a far cry from the grimy Marcy Projects sights that he once detailed, something that perhaps is to be expected from the self-described 'new Sinatra'." The Daily Telegraph described the song's sound as "anthemic club pop" and called Keys's chorus line a "singalong". Shannon Barbour of About.com called "Empire State of Mind" the album's apex, while commending Keys for her "excellent display of some unusually strong vocals". Slant Magazine writer William McBee described it as a "glittering paean to the Big Apple" with Keys "soaring skyscraper-level on the hook and Jay putting on for his city." IGN music reviewer Chris Carle described Keys as having "soaring vocals" in the song. New York Post writer Ryan Brockington called "Empire State of Mind" his favorite song from The Blueprint 3 and Tyler Gray from the same publication said "Empire State of Mind" was the "most soulful" song on the album. Francois Marchand of the Vancouver Sun called the song "shiver-inducing". The Times writer Stephen Dalton called the track a "heartfelt love letter to New York City," with Jay-Z playing the "hip-hop Sinatra" over Keys' "luscious" chorus, and The Guardian's Alexis Petridis described its chorus as "incredible, breezy pop". Killan Fox of the same publication felt that the track was a "terrific homage" to New York and listed the song as being one of the "really good tracks" on The Blueprint 3. Pitchfork Media's Ian Cohen stated that "the piledriver hooks of "Run This Town" and "Empire State of Mind" are content to annoy their way to ubiquity". "Empire State of Mind" has been included in multiple music critics list for the best songs of 2009. The single was ranked the 8th best song of 2009 by MTV, the second-best song of 2009 by Rolling Stone magazine, and was voted the best single of 2009 by The Village Voice's 37th annual Pazz & Jop critics' poll. On the 2010 Pazz & Jop list, the song was, along with a number of other songs, ranked at 226. Jon Pareles of The New York Times placed "Empire State of Mind" at number three on his list of the top songs of 2009, and Pitchfork Media also ranked it at number 44 on its The Top 100 Tracks of 2009 list. Entertainment Weekly placed it number one on its list of "The 10 Best Singles of 2009". "Empire State of Mind" was placed at number six on NME's Albums and Tracks of the Year, 2009 list. It was placed at number nine on PopMatters' list of "The Best Singles of 2009" and at number twelve on Consequence of Sound's list of "The Top 50 Songs of ’09". The song appears at number one on Rap-Up's list of the 25 best songs of 2009. Jay-Z, a long-time fan of the New York Yankees, said that he was elated that his songs, namely "Empire State of Mind" and "Run This Town", had been played during different Yankee player's batting at home games in the 2009 World Series, commenting that it was "incredible" and "beyond explanation" to hear his music being played during Yankee games. New York Mayor Michael Bloomberg commented that "Empire State of Mind" had become "one of the newest anthems of the Yankees". The New York Daily News included it at number ten on its list of "The 10 best songs about New York". At the 53rd Grammy Awards ceremony the track won Best Rap/Sung Collaboration and Best Rap Song. It had also been one of the five nominees for Record of the Year. In February 2011, Billboard placed the song at number 15 on its list of "The 40 Biggest Duets Of All Time" and in September 2011, the song was placed at number eight by VH1 on its list for the 100 Greatest Songs of the '00s. In October 2011, NME placed it at number 13 on its list "150 Best Tracks of the Past 15 Years". Additionally, in Summer 2012, an advertisement for New York State touting its economic comeback features the piano loop of this song along with Key's voice singing "New York". Complex placed the song at number nine on its list of "The 100 Best Jay-Z Songs" and on number four on its list of "The 25 Best Alicia Keys Songs", noting that the song "has replaced Frank Sinatra's "New York, New York" as the city's go-to anthem, and remains one of Keys' greatest contributions to pop culture". In July 2013, PopMatters placed the song at number six on its list of "The Top 20 Jay-Z Songs to Date", remarking that "Alicia Keys’ voice soars through the city night as Hov offers up his typical wit and, in this case, New York authenticity", making the song to become "the unofficial anthem of the most celebrated city in the world". In May 2012, in a poll published by the Official Charts Company, "Empire State of Mind" ranked as the 76th biggest selling single of the 21st century in the United Kingdom. "Empire State of Mind" was ranked at number 14 the 2009 Pitchfork Media's "Song of the Year" Reader's Poll. "Empire State of Mind" gave Jay-Z his first number one single on the Billboard Hot 100 as a lead artist. "Empire State of Mind" achieved commercial success worldwide. In the United States the track peaked at number one on the Billboard Hot 100 for five consecutive weeks, from November 28 to December 26, replacing "Fireflies" by Owl City for the top position and giving Jay-Z his first number one single on that chart as a lead artist in his fourteen-year career. The song, which was both artists' fourth number one entry on the chart, became the first Billboard Hot 100 number one single to reference New York in its title. Moreover, it was included in Billboard's year-end music charts for 2009 at number sixty two and was the last number one single for the 2000s (decade). According to Billboard magazine, the song was the 15th biggest hit by two recording artists for all time. The single sold 205,000 digital copies in the US in its opening week and its highest week sale was of 360,000 in December 2009. "Empire State of Mind" has also peaked at number one on the Billboard component chart for the sales of legal digital downloads on October 3, 2009, as well as topping the Billboard component chart for singles with the most radio airplay throughout the country for eight consecutive weeks from November 28 to January 23, 2010. The track also peaked at the top position on the R&B/Hip-Hop songs chart for three consecutive weeks, as well as topping the Billboard Rap Songs chart for nine consecutive weeks. After five months of release "Empire State of Mind" was certified three times platinum by the Recording Industry Association of America (RIAA) for the shipment of over 3,000,000 units in the US. By August 2012, the single has reached its 5 millionth sales mark in the US, and as of June 2014, the song has sold 5,513,000 copies in the US. In the United Kingdom the track debuted at number fifteen and, in the two succeeding weeks, the single peaked at number two, having been held from the top position by Taio Cruz's "Break Your Heart". "Empire State of Mind" peaked at number three on the Canadian Hot 100 and was listed as being the top digital gainer on December 12. The song peaked at number four in Australia, and was certified gold by the Australian Recording Industry Association (ARIA) for the shipment of 35,000 units in the country. "Empire State of Mind" was also included in Australia's 2009 year-end music chart at number sixty-four. In New Zealand the song peaked at number six. Furthermore, the single was certified gold by the Recording Industry Association of New Zealand (RIANZ) for the shipment of over 7,500 units in New Zealand. The single debuted at number eighteen in France, eventually peaking at number eight in the following three weeks. It also peaked at number four in Belgium's Flemish and French charts. The song also peaked within the top ten positions in the music charts of Denmark, Ireland, Italy, Finland, the Netherlands, and Sweden. In Italy "Empire State of Mind" was certified multi-platinum. "Empire State of Mind"'s least commercially successful charting territories were Austria, Brazil, and Spain; peaking at number thirteen, seventeen, and twenty-seven respectively. The music video for "Empire State of Mind" was directed by Hype Williams. The video, which was filmed on location, features black-and-white images of New York City intercut with full-color shots of Jay-Z and Keys performing in Times Square. "Empire State of Mind"'s music video began filming on September 29, in Tribeca and around Ground Zero, and was released on October 30, 2009. Keys praised the music video and said that the video has all the key elements of a homage to her hometown. The music video opens with black and white images of locations in New York being shown in the form of a slideshow. The slideshow is then intercut with a black and white clip of Jay-Z, wearing a Yankees cap and a vest with no sleeves, performing the song on a street in front of apartment buildings. 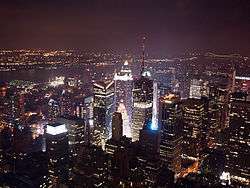 Then the video begins to rotate from images of New York being shown briefly, to clips of Jay-Z singing "Empire State of Mind" in several locations with different outfits. Images shown include a monument to John D. Rockefeller, Jr., street signs and stairwells leading to subway stations. Next we see black and white clips of Keys, who is wearing large hoop-earrings with high heels, a black shirt and pants, playing a Yamaha piano that has an image of the Statue of Liberty on it. She is singing her verse of the song in a street at night while cars drive by. Keys' performance is then intercut with aerial views of skyscrapers and clips of the Yankee Stadium, clips of the New York Police, and NYPD cars and logos. Some people, such as ones who are walking around New York or wearing Yankee emblems, have their faces shown or blurred out. Keys and Jay-Z, both wearing sunglasses at night, are then shown performing the song together as the video continues to be intercut with clips of them performing "Empire State of Mind" individually, as well as images of New York. The video ends with color vision of the duo performing at night on the red glass steps forming the roof of the TKTS pavilion in Times Square. Interspersed are clips of Keys playing piano and views of the New York skyline. Jay-Z's Lifestyle blog came out with an alternative video which features supermodels lip-syncing to the song in various locations in Manhattan. The video was directed by Justin Wu. The New York Observer wrote of the video that "[w]e’re not sure exactly what this video is promoting" but "the caliber of the cast’s sheer ubiquity is impressive". A blogger on Yahoo Music commented that the models "do a better job modeling clothes than miming Jigga", but concluded, however, that the video is "without a doubt the greatest lip-dub ever committed to video". "Empire State of Mind" was first performed at Jay-Z's "Answer the Call" benefit concert in Madison Square Garden on September 11, 2009, where it was the opening song. All ticket proceeds from the show went to the New York Police and Fire Widows and Children's Fund. The song was then performed live at the 2009 MTV Video Music Awards (MTV VMA) on September 13, 2009, where it closed the awards show. The VMA performance was the first time Jay-Z and Keys performed the song together. Shaheem Redi of MTV News commented on the performance that, "Their set was elegant and 'hood at the same time, and it was such a powerful moment". Ryan Brockington of the New York Post wrote "Alicia's buttery voice and Jay-Z's impeccable stage presence made for an audio adrenaline overload" and placed the performance third on his list of the "top six performances" from the MTV VMAs. For the performance Jay-Z wore his signature Yankees cap and Keys wore all black while playing the piano. During the MTV VMA performance images of locations in New York, such as the Empire State Building and the Apollo Theatre, were shown on an overhead screen behind Jay-Z and Keys. Towards the end of the performance rapper Lil' Mama got up onto the stage uninvited and posed with Jay-Z and Keys while they were finishing the final verse of the track. Lil' Mama said she did not mean to disrespect either performer but the song had her "emotions running high", adding that "in that moment I came up onstage to celebrate my two icons singing about NY." Keys responded to the incident saying "We can appreciate her being overwhelmed and inspired, but we would have appreciated it if she would have done it from her seat", and Jay-Z added, "It was a lot of planning that went into that performance. To disrupt that was outta line." Leah Greenblatt of Entertainment Weekly said that the duo "brought some genuine street heat to the tongue-twisting torrents" of "Empire State of Mind". She added that "Keys, on piano and soaring chorus, brought the feminine strength and soul." Jay-Z was due to perform "Empire State of Mind" with Keys during the opening game of the baseball 2009 World Series in early October 2009 but, due to an inclement weather, the duo did not perform. They ultimately performed the song live in the Yankee Stadium before Game 2 of the 2009 World Series in mid October. The two musicians performed the song on a custom-made stage adorned with Yankees flags, while images of New York City flashed across several large screens throughout the stadium. Jayson Rodriguez of MTV News wrote of the performance, "If the Yankees were looking to change their tune heading into Game 2 of the World Series, they couldn't have picked better musical guests." During most live performances of the track, the lyrics containing profanity are included in the song, but they were omitted for the World Series set. On November 5, 2009, Jay-Z and Keys sang "Empire State of Mind" at the MTV Europe Music Awards (EMA) in Berlin, Germany, while performing in front of a New York cityscape. Jocelyn Vena and Eric Ditzian of MTV News noted that Jay-Z "took his hometown pride rather seriously" during the performance. Jay-Z also performed the song at the Yankees' World Series victory ceremonies in New York City Hall on November 6, 2009. Keys was not in attendance for the performance, so singer and Roc Nation recording artist Bridget Kelly filled in. As the last verse of the song was sung, Yankee members got up from their seats to shower Jay-Z with handshakes and hugs. The single was also performed by Jay-Z and Keys at the American Music Awards (AMA) on November 22, 2009. They began their performance of "Empire State of Mind" with a rendition of Frank Sinatra's "New York, New York". Keys played on a piano on a stage with blue lights in front of a backdrop that had tall buildings. Also, the words "New York" scrolled across screens on the stage. Towards the end of the song, Keys sang with Jay-Z at the front of the stage while holding up a "I love you" sign. Todd Martens of the Los Angeles Times felt that the song had "worn out its welcome", and gave the performance a letter grade "D". However, Jeremy Blacklow of Access Hollywood had a more positive feeling towards the performance, describing it as being "so great" in his live blog for the award ceremony. "Empire State of Mind" was performed by Jay-Z and Alicia Keys at the 2010 BRIT Awards on February 16, 2010. The Guardian wrote that Jay-Z and Alicia Keys "dazzled with their rendition of "Empire State of Mind"". The Daily Mail commented on the performance that it was "a rare highlight in a show of lowlights". According to Metro, Jay-Z and Alicia Keys "blew the place away" with their performance and "Jay-Z was given a welcome befitting a cultural hero" while "Keys oozed elegance and soul as her startlingly powerful voice stopped everyone in their tracks”. The Nation opined that the pair "delivered a powerful rendition" of the song. In March, Jay-Z joined Keys onstage during one of her Freedom Tours New York concerts to perform "Empire State of Mind", while images of New York were shown throughout the concert arena. Jay-Z performed "Empire State of Mind" as well as three of his other singles, at California's Coachella music festival in April 2010. Jay-Z performed the song live on an episode of Saturday Night Live on May 9, 2010. 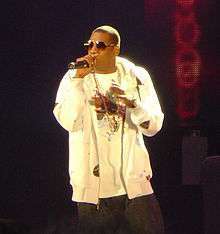 Jay-Z performed the song with a medley of his other singles, including "On to the Next One". Jay-Z wore a white T-shirt with a black leather vest while performing the song on a stage light by blue lights, with musicians playing instruments in the far back. Caitlyn Millat of San Diego's NBC felt that Jay-Z "brought the house down" during his performances of the melodies. Rodriguez of MTV News said that Bridget Kelly, who sang Keys' part, "turned more than a few heads" because the outfit she was wearing was "tighter than her boss' rhyme". On October 9, 2016, Keys performed a surprise free concert in the middle of Times Square itself, featuring guests such as John Mayer and Questlove. "Empire State of Mind" was the second to last song of the show, which began with an acoustic rendition of Keys' sequel, but soon transitioned to the original song. Jay-Z joined Keys on stage as his verse began, drawing much excitement from the crowd that filled the Square. Following the release of "Empire State of Mind" in January 2010, Keys stated that she was planning to release a second version of the song as a single the following month, featuring only her vocals. The track, entitled "Empire State of Mind (Part II) Broken Down", appeared on Keys' fourth studio album The Element of Freedom which was released in December 2009. The original version, entitled "Empire State of Mind Part 2", included both Keys' vocals and a new rap verse from Jay-Z, but the final product did not include Jay-Z. Discussing the record, Keys claimed that it acts as a dichotomy of strength and vulnerability, commenting that "The music is really strong, and the drums are really aggressive, but my voice is vulnerable and delicate". — Keys on recording "Empire State of Mind (Part II) Broken Down"
"Empire State of Mind (Part II) Broken Down" was generally well received by contemporary music critics in their reviews for The Element of Freedom. Allison Stewart of The Washington Post noted that the track, which is a pop ballad, had replaced "Empire State of Mind" sports team references and ruminations with "even milder and less controversial string of generalities", highlighting Keys' version's lyrics "If I could make it here/I could make it anywhere". The track was not as commercially successful as "Empire State of Mind", peaking at number four in the United Kingdom, number forty on the Canadian Hot 100, and number sixty-nine in Sweden. It also debuted on the Billboard R&B charts at number seventy-seven and peaked at number fifty-five on the Billboard Hot 100 without an official release. The comedy website CollegeHumor parodied the song in a video titled "Galactic Empire State of Mind" which re-writes the lyrics to follow the events of the first three Star Wars films from the perspective of Darth Vader. The video has been viewed nearly four million times on YouTube. The music video for "Newport (Ymerodraeth State of Mind)" parodies the song, replacing references to the "Empire State" of New York with of the smaller Welsh city of Newport. In the Welsh language Ymerodraeth means "empire". "Newport (Ymerodraeth State of Mind)" was directed by British filmmaker M-J Delaney and featured London-based actors Alex Warren and Terema Wainwright, rapping and singing respectively. Days after its release Delaney said: "I hope Jay-Z and Alicia get to see the video as long as their publishing people don't force us to take it offline. It's only tongue in cheek." Its participants were invited to appear on national television news and their work was reported in national newspapers. Their work was also so well received in Wales that they were invited to the reopening of the Newport Transporter Bridge. It achieved viral video status when it reached nearly a million hits in 3 days and, by August 2010, nearly 2.5 million people had watched it on YouTube. In July both Warren and Wainwright met with Universal Records (the music publishers) to discuss releasing the track as a single, with some of the proceeds going to the mental health charity Newport Mind. But the seven co-writers of "Empire State of Mind" refused to give permission for the Newport single, a situation which led to the video being removed from YouTube on August 10. "Empire State of Mind" was covered by the cast of the US television series Glee for the second season premiere episode "Audition" on September 21, 2010. In the episode the fictional William McKinley High School glee club, upon learning that Nationals will be held in New York, decide to perform "Empire State of Mind" at the school courtyard, in the hopes it will pique the interest of their schoolmates. MTV's Kyle Anderson felt that the choreography of "Empire State of Mind" compensated for any awkwardness in its delivery. Aly Semigran, also writing for the same publication, thought the cast's performance was lacking the gravitas of the original version, but reported that Keys had deemed the Glee cover "amazing". Lisa de Moraes of The Washington Post found the song's performance to be "maybe-trying-too-hard". Music critic Tom Stack, of Entertainment Weekly, had a more positive assessment of Glee's take on it in the episode, stating that from the wardrobe to the choreography, it was "spectacular" and elating. He gave it a letter grade of "A". MTV Buzzworthy wrote that "[t]hings get a little dicey when the male cast members make their way through Jay’s rapped first verse". Glee's cover version was released as a single and debuted at number twenty-one on the Billboard Hot 100, taking the title for biggest jump of that week. It also charted number twenty in Australia. In 2010, American alternative dance band LCD Soundsystem played "Empire State of Mind" in concert, performing a verse of the song as a duet between James Murphy and keyboardist Nancy Whang. In May 2011, at 64th Cannes Film Festival, British singer-songwriter Jamie Cullum performed a piano medley of Frank Sinatra's "New York, New York" and "Empire State of Mind" in honour of Robert De Niro. In February 2012, British singer Ed Sheeran did a soulful acoustic rendition of the song at BBC Radio 1's Live Lounge. Sheeran later sang it as a duet with Jason Mraz at the Jingle Ball Viewing Party in December 2012. In April 2012, British glam rock band Sweet released an updated version of the Hello and Ace Frehley hit single "New York Groove" that incorporated the chorus of "Empire State of Mind" into its own chorus. The song was also parodied in The Simpsons episode "The Food Wife" as "Bloggin' a Food Blog", sung by Tim Heidecker, Eric Wareheim and Carmen Carter. 1 2 Grein, Paul. "Chart Watch: 'Rude,' 'Summer' Hit Top 10". Yahoo!. Retrieved 4 June 2014. 1 2 3 4 5 6 7 8 9 10 11 Concepcion, Mariel (December 11, 2009). "'Empire State of Mind' Co-writer In Disbelief Over Song's Success". Billboard. Retrieved May 25, 2010. 1 2 Kennedy, Gerrick D. (February 13, 2011). "Grammy Awards: 'Empire State of Mind' producer Al Shux knows hip hop -- and the metric system". Los Angeles Times. Tribune Company. Retrieved June 5, 2011. 1 2 Vena, Jocelyn (October 29, 2009). "Alicia Keys 'Grateful' To Jay-Z For 'Empire State of Mind'". MTV. Viacom. Retrieved May 19, 2010. 1 2 Minaya, Marcell (February 20, 2010). "Jay-Z: 'Keys was second choice on Empire'". Digital Spy. Digital Spy Limited. Retrieved May 3, 2010. 1 2 3 4 5 "Empire State of Mind — Jay-Z Digital Sheet Music (Digital Download)". MusicNotes.com. EMI Music Publishing. Retrieved April 30, 2010. 1 2 Trust, Gary (November 19, 2009). "Chart Beat Thursday: Bon Jovi, Jay-Z, Bad Lieutenant". Billboard. Retrieved May 3, 2010. 1 2 Cashmore, Pete (September 18, 2009). "Album review: Jay-Z - 'The Blueprint III'". NME. UK. Retrieved April 30, 2010. ↑ Concepcion, Mariel (September 11, 2009). "Jay-Z, "Blueprint 3"". Billboard. Retrieved 2010-05-01. 1 2 Dalton, Stephen (September 11, 2009). "Jay-Z: The Blueprint 3". The Times. UK: Times Newspapers Ltd. Retrieved May 1, 2010. ↑ Rodriguez, Jayson (September 11, 2009). "Mary J. Blige Looking Forward To 'Huge' Jay-Z And Alicia Keys VMA Performance". MTV. Viacom. Retrieved May 2, 2010. 1 2 "Dan Gross: Jay-Z to tone down his act". The Philadelphia Inquirer. Philadelphia Newspapers, LLC. October 29, 2009. 1 2 "Song Lyrics Cleaned Up For World Series". Morning Edition. National Public Radio. October 28, 2009. ↑ Mudhar, Raju (October 29, 2009). "Concert Sampler". Toronto Star. Toronto Star Newspapers Ltd. Retrieved May 1, 2010. ↑ Jayson Rodriguez; Shaheem Reid (September 1, 2009). "Jay-Z 'Excited' For Fans To Hear Blueprint 3 On 'The Leak'". MTV. Viacom. Retrieved May 2, 2010. ↑ Vozick-Levinson, Simon (May 10, 2010). "Who was that singing with Jay-Z on 'Saturday Night Live'? Meet Bridget Kelly". Entertainment Weekly. Time Warner Inc. Retrieved May 11, 2010. ↑ "Jay-Z wasn't happy with Alicia Keys' first take for Empire State Of Mind". 3 News NZ. November 14, 2012. ↑ Bush, John. "The Blueprint 3". Allmusic. Rovi Corporation. Retrieved May 1, 2010. ↑ Kot, Greg (September 9, 2009). "Review: Jay-Z's The Blueprint 3". Los Angeles Times. Tribune Company. Retrieved May 1, 2010. ↑ Rosen, Jody. "Review: The Blueprint 3". Rolling Stone. Wenner Media LLC. ↑ Jones, Steve (September 2, 2009). "Jay-Z's 'Blueprint 3' proves to be a different kind of original". USA Today. Gannett Company, Inc. Retrieved April 30, 2010. ↑ "Jay Z - The Blueprint 3, review". The Daily Telegraph. UK: Telegraph Media Group Limited. September 8, 2009. Retrieved April 30, 2010. ↑ Barbour, Shannon. "Jay-Z - 'Blueprint 3' (Roc Nation)". About.com. Retrieved May 1, 2010. ↑ McBee, William (September 7, 2009). "Jay-Z The Blueprint 3". Slant Magazine. Retrieved May 2, 2010. ↑ Carle, Chris (September 15, 2009). "Jay-Z: The Blueprint 3 Review". IGN. Retrieved May 1, 2010. 1 2 Brockington, Ryan (September 14, 2009). "Top six performances from the 2009 VMAs". New York Post. Paul Carlucci. Retrieved May 3, 2010. ↑ Gray, Tyler (September 6, 2009). "Jay-Z's '3'-peat". New York Post. Paul Carlucci. Retrieved May 3, 2010. ↑ Marchand, Francois (October 16, 2009). "Jay-Z's so big they call him 'Mister'". The Vancouver Sun. Canada: Canwest Publishing Inc.
↑ Petridis, Alexis (September 10, 2009). "Review: The Blueprint 3". The Guardian. UK: Guardian News and Media Limited. Retrieved May 1, 2010. ↑ Fox, Killan (September 13, 2009). "Jay-Z: The Blueprint 3". The Guardian. Guardian News and Media Limited. Retrieved May 1, 2010. ↑ Cohen, Ian (September 14, 2009). "Jay-Z The Blueprint 3". Pitchfork Media. Pitchfork Media Inc. Retrieved May 1, 2010. ↑ Montgomery, James (December 9, 2009). "The Best Songs Of 2009, In Bigger Than The Sound". MTV. Viacom. Retrieved April 29, 2010. ↑ "The 25 Best Songs of 2009". Rolling Stone. Wenner Media LLC. ↑ "Singles — All Votes". The Village Voice. Village Voice Media. Retrieved May 3, 2010. ↑ "Pazz + Jop 2010 Singles — All Votes". The Village Voice. Village Voice Media. Retrieved June 22, 2014. ↑ Parales, Jon (December 17, 2009). "Reggae and Rock Operas, Intimacies and Anthems". New York Times. ↑ Pitchfork Staff (December 14, 2009). "The Top 100 Tracks of 2009". Pitchfork Media. Pitchfork Media Inc. Retrieved April 29, 2010. ↑ "The 10 Best Singles of 2009: EW's definitive list". ↑ "Albums and Tracks of the Year for 2009". NME. IPC Media Entertainment Network. Retrieved 2014-03-12. ↑ PopMatters Staff (17 December 2009). "The Best Singles of 2009". PopMatters. Retrieved 21 June 2014. ↑ Cosstaff (December 22, 2009). "CoS Year-End Report: The Top 50 Songs of 2009". Consequence of Sound. Retrieved 21 June 2014. ↑ "Rap-Up's 25 Best Songs of 2009". Rap-Up. Retrieved June 22, 2014. ↑ Reid, Shaheem (October 30, 2009). "Jay-Z Says It's 'Incredible' Hearing His Music At Yankee Stadium". MTV. Viacom. Retrieved April 29, 2010. 1 2 3 Reid, Shaheem (November 6, 2009). "Jay-Z Performs 'Empire State of Mind' At Yankees Parade". MTV. Viacom. Retrieved November 7, 2009. ↑ "From Jay-Z to Sinatra: The 10 best songs about New York". The New York Daily News. Retrieved 20 June 2014. ↑ Anderson, Kyle (29 September 2011). "U2, Rihanna, Amy Winehouse, Foo Fighters fill out VH1's '100 Greatest Songs of the '00s'". Entertainment Weekly. Time Inc. Retrieved 3 June 2014. ↑ "The 40 Biggest Duets of All Time". Billboard. Prometheus Global Media. February 14, 2011. Retrieved 2015-10-24. ↑ "150 Best Tracks Of The Past 15 Years". Nme.Com. November 25, 2012. Retrieved December 7, 2012. ↑ Andrew Barber (Sep 7, 2011). "The 100 Best Jay-Z Songs". Complex. Retrieved 20 June 2014. ↑ Colin McGuire (Jul 2, 2013). "The Top 20 Jay-Z Songs to Date". PopMatters. Retrieved 20 June 2014. ↑ "The Official Top 150 Biggest Selling Singles Of the 21st Century revealed!". The Official Charts Company. Retrieved 22 June 2014. ↑ "2009 Pitchfork Readers Poll - Pitchfork". ↑ Pietroluongo, Silvio (December 17, 2009). "Jay-Z, Keys' 'Empire' Tops Hot 100 For Fifth Week". Billboard. Retrieved May 5, 2010. 1 2 Pietroluongo, Silvio (November 18, 2009). "Jay-Z Jumps To No. 1 On The Hot 100". Billboard. Retrieved May 5, 2010. 1 2 "Charts Year End: The Billboard Hot 100". Billboard. ↑ "THE 40 BIGGEST DUETS OF ALL TIME". Billboard. Retrieved March 4, 2011. ↑ Grein, Paul (May 19, 2010). "Week Ending May 16, 2010: Battle Of The Home-State Anthems". Yahoo! Inc. Retrieved May 20, 2010. ↑ "Digital Songs: Week of October 3, 2009". Billboard. Retrieved May 5, 2010. ↑ "Radio Songs: Week of November 28, 2009". Billboard. Retrieved May 5, 2010. ↑ "R&B/Hip Hop Songs: Week of November 28, 2009". Billboard. Retrieved May 5, 2010. ↑ "Rap Songs: Week of January 9, 2010". Billboard. Retrieved May 5, 2010. ↑ Paul Grein (August 22, 2012). "Week Ending Aug. 19, 2012. Songs: Swift Makes Digital History". Chart Watch. Yahoo Music. 1 2 "Empire State of Mind". The Official Charts Company. Retrieved May 3, 2010. ↑ "Chart For Week Up To 10/10/2009". The Official Charts Company. Retrieved May 5, 2010. 1 2 "Week of December 12, 2009". Billboard. Archived from the original on August 22, 2008. Retrieved May 3, 2010. 1 2 3 4 5 6 7 8 9 10 11 12 13 14 15 16 17 18 19 20 21 "JAY-Z + ALICIA KEYS – EMPIRE STATE OF MIND (CHANSON)". LesCharts.com. Hung Medien. Retrieved April 27, 2010. 1 2 "ARIA TOP 40 URBAN SIGLES CHART". Australian Recording Industry Association. 1 2 "ARIA Charts — End Of Year Charts — Top 100 Singles 2009". Australian Recording Industry Association. Retrieved April 27, 2010. 1 2 "New Zealand single certifications – Empire State of Mind". Recorded Music NZ. Retrieved August 22, 2012. ↑ "Brazil Hot 100 Airplay". Billboard Brazil (in Portuguese). Brazil. 79 (2). April 1, 2010. 1 2 3 4 Vena, Jocelyn (November 2, 2009). "Jay-Z, Alicia Keys Shoot 'Empire State of Mind' Video Near Ground Zero". MTV. Viacom. Retrieved April 30, 2010. ↑ "Empire State of Mind | Life+Times". Lifeandtimes.com. September 20, 2011. Retrieved December 7, 2012. ↑ "Watch a Bunch of Supermodels Lip-Sync Jay-Z's "Empire State of Mind"". ↑ "WATCH: A Bunch Of Models Singing 'Empire State Of Mind'". September 19, 2011. ↑ "Meet the Models From Jay-Z's Fashion Week Edition of "Empire State of Mind" [Pics]". September 19, 2011. 1 2 3 Rodriguez, Jayson (September 14, 2009). "Jay-Z, Alicia Keys Close VMAs With Ode To New York". MTV. Viacom. Retrieved April 29, 2010. 1 2 Vozick-Levinson, Simon (September 29, 2009). "Jay-Z 'Answers the Call' in NYC with help from Rihanna, Beyonce, Kanye West, John Mayor and the rest of his Rolex". Entertainment Weekly. Time Warner Inc. Retrieved April 29, 2010. 1 2 "Exclusive: Lil Mama Apologizes For Crashing Jay-Z's VMA Performance". MTV. Viacom. September 14, 2009. Retrieved April 29, 2010. ↑ Reid, Shaheem (December 17, 2009). "Jay-Z Continues His Hip-Hop Reign As No.2 Man Of The Year". MTV. Viacom. Retrieved April 29, 2010. ↑ Reid, Shaheem (September 14, 2009). "Lil Mama Crashes Jay-Z And Alicia Keys' VMA Performance". MTV. Viacom. Retrieved April 29, 2010. 1 2 3 4 Reid, Shaheem (September 23, 2009). "Jay-Z Says Lil Mama's VMA Stage Invasion Was 'Outta Line'". MTV. Viacom. Retrieved April 29, 2010. ↑ Greenblatt, Leah (September 18, 2009). "Best of the VMAS". Entertainment Weekly. Time Warner Inc. Retrieved May 8, 2010. ↑ Reid, Shaheem (November 6, 2009). "Jay-Z Joins Alex Rodriguez At New York Yankees Victory Parade". MTV. Viacom. Retrieved April 29, 2010. 1 2 Ghiroli, Brittany (October 29, 2009). "Jay-Z, Keys take center stage in Bronx: Duo performs 'Empire State of Mind' prior to Game 2". Major League Baseball. Retrieved April 29, 2010. 1 2 3 Jocelyn Vena; Eric Ditzian (November 5, 2009). "Jay-Z Brings New York To Germany For MTV Europe Music Awards". MTV. Viacom. Retrieved April 29, 2010. 1 2 "2009 American Music Awards performances: Jennifer Lopez, Rihanna, Janet Jackson, Alicia Keys & more". New York Examiner. Clarity Digital Group LLC. November 22, 2009. 1 2 Reid, Shaheem (November 23, 2009). "Jay-Z, Alicia Keys Rock American Music Awards With 'Empire State of Mind'". MTV. Viacom. Retrieved April 29, 2010. ↑ Martens, Todd (November 22, 2009). "2009 American Music Awards: Grading the performances". Los Angeles Times. Tribune Company. Retrieved May 11, 2010. ↑ Blacklow, Jeremy (November 22, 2009). "Live Blogging The American Music Awards". Access Hollywood. NBCUniversal Media, LLC. Retrieved May 11, 2010. ↑ Andre Paine (February 16, 2010). "Lady Gaga, JLS, Florence Rule At BRIT Awards". Billboard. Retrieved 21 June 2014. ↑ Kitty Empire (21 February 2010). "At the Brit awards, all we see is Lady Gaga, as Liam Gallagher reverts to type". The Guardian. Retrieved 21 June 2014. ↑ Chris Johnson and Simon Cable (17 February 2010). "Brit Awards 2010: Three gongs for Lady Gaga, two for JLS and one at last for Lily Allen". The Daily Mail. Retrieved 21 June 2014. ↑ Ann Lee (17 Feb 2010). "Brit Awards 2010: 30th anniversary labelled 'best ever'". Metro. Retrieved 21 June 2014. ↑ Our Staff Reporter (February 18, 2010). "Lady Gaga dominates 30th Brit Awards". The Nation. Retrieved 21 June 2014. ↑ Margaret Wappler; August Brown (April 19, 2010). "A weekend pass well-earned". Los Angeles Times. Tribune Company. Retrieved April 29, 2010. 1 2 Millat, Caitlyn (May 9, 2010). "Betty White, Jay-Z Celebrate Golden Years on "SNL"". NBC. NBCUniversal Media, LLC. Retrieved May 9, 2010. ↑ Moore, Michael Langston (May 9, 2010). "Jay-Z rocks the SNL stage with Mr. Hudson, Bridget Kelly in tow (Video)". The Examiner. Clarity Digital Group LLC. ↑ Rodriguez, Jayson (May 9, 2010). "Jay-Z Dedicates 'Young Forever' To Betty White On 'SNL'". MTV. Viacom. Retrieved May 9, 2010. ↑ "Watch Alicia Keys and Jay Z Perform 'Empire State of Mind' in Times Square". Billboard. Retrieved 2016-10-10. 1 2 Balls, David (January 13, 2010). "Keys to release solo version of 'Empire'". Digital Spy. Digital Spy Limited. Retrieved April 27, 2010. ↑ Vena, Jocelyn (November 5, 2009). "Jay-Z and Alicia Keys Record 'Empire State of Mind Part 2'". MTV. Viacom. Retrieved April 27, 2010. ↑ Aswad, Jem; Vena, Jocelyn (December 4, 2009). "Alicia Keys Collabos with Beyoncé, Drake Hit the Net". MTV. Viacom. Retrieved April 27, 2010. ↑ Graff, Gary (February 1, 2010). "Interview: Alicia Keys, singer". The Scotsman. UK: Johnston Press Digital Publishing. Retrieved April 28, 2010. ↑ Christgau, Robert. "The Element of Freedom". Consumer Guide. Robert Christgau. Retrieved April 27, 2010. ↑ Radlift, Ben (December 14, 2009). "ALICIA KEYS: "The Element of Freedom"". The New York Times. Retrieved April 27, 2010. ↑ Ragogna, Mike (December 14, 2009). "HuffPost Reviews: Alicia Keys, Robin Thicke, Avatar, and Pixies, Plus Conversations with Julian Lennon and Precious Composer Mario Grigorov, and more". The Huffington Post. HuffingtonPost.com, Inc. Retrieved April 27, 2010. ↑ Stewart, Allison (December 15, 2009). "'Element' is another safe, uninspiring album from R&B star Alicia Keys". The Washington Post. The Washington Post Company. Retrieved April 27, 2010. ↑ "Empire State of Mind (Part II)". The Official Charts Company. Retrieved April 27, 2010. ↑ "Empire State of Mind (Part II) Broken Down — Alicia Keys". Billboard. Retrieved April 27, 2010. ↑ "ALICIA KEYS — EMPIRE STATE OF MIND (PART II) BROKEN DOWN (CHANSON)". LesCharts.com. Hung Medien. Retrieved April 27, 2010. ↑ Billboard charts for "Empire State of Mind (Part II)" Billboard. Nielsen SoundScan. Accessdate=2010-03-13. ↑ "Galactic Empire State of Mind - CollegeHumor Video". collegehumor.com. CollegeHumor. Retrieved 22 April 2015. ↑ "Galactic Empire State of Mind - YouTube". youtube.com. CollegeHumor. Retrieved 22 April 2015. ↑ McCarthy, James (July 25, 2010). "Jay-Z video rap spoof set for its millionth hit". Western Mail. Media Wales Ltd. Retrieved June 5, 2011. 1 2 3 Bloxham, Andy (August 11, 2010). "Newport State of Mind parody removed over copyright issues". The Daily Telegraph. Telegraph Media Group Limited. Retrieved June 4, 2011. ↑ "Newport State of Mind removed amid copyright claim". BBC News. BBC. August 10, 2010. Retrieved June 4, 2011. ↑ "Newport State of Mind: songwriters pulled the video from YouTube". The Guardian. Guardian News and Media Limited. August 11, 2010. Retrieved June 4, 2011. ↑ Anderson, Kyle (September 22, 2010). "'Glee' Season Two Premiere Embraces Hip-Hop Via Jay-Z And Travie McCoy". MTV. Viacom. Retrieved September 22, 2010. ↑ Semigran, Aly (September 22, 2010). "'Glee' Season-Two Premiere Gets Into 'Empire State of Mind'". MTV. Viacom. Retrieved September 22, 2010. ↑ de Moraes, Lisa (September 22, 2010). "'Glee' premiere: The music". Washington Post. The Washington Post Company. Retrieved September 22, 2010. ↑ Stack, Tim (September 22, 2010). "'Glee' recap: Let's Hear It for New Dorks". Entertainment Weekly. Time Warner Inc. Retrieved September 22, 2010. ↑ 09/15/2010, Chris Ryan. "Song You Need To Know: Cast Of 'Glee' Cover Jay-Z And Alicia Keys' 'Empire State Of Mind'". ↑ "Hot 100: Week of October 09, 2010 (Biggest Jump)". Billboard. September 30, 2010. Retrieved September 22, 2011. ↑ "GLEE CAST - EMPIRE STATE OF MIND (CHANSON)". LesCharts.com. Hung Medien. Retrieved June 5, 2011. ↑ "Watch: LCD Soundsystem's "Empire State of Mind" NYC Tribute - Pitchfork". ↑ "Watch: LCD Soundsystem covers "Empire State of Mind"". May 24, 2010. ↑ "Cullum serenades De Niro at Cannes". May 12, 2011. ↑ "Ed Sheeran Covers Jay-Z's 'Empire State of Mind'". Rap-Up. February 5, 2012. Retrieved May 6, 2014. ↑ Lee, Ashley (December 9, 2012). "Jason Mraz Curates Special Set List for Myanmar's First International Concert". The Hollywood Reporter. Retrieved May 6, 2014. ↑ "Empire State Of Mind [Jay-Z + Alicia Keys] (Explicit)". Amazon.com. Retrieved June 20, 2014. 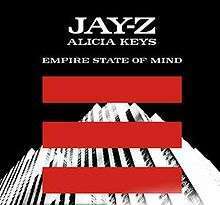 ↑ "Jay-Z + Alicia Keys – Empire State of Mind". Discogs. Retrieved April 27, 2010. ↑ "Jay-Z & Alicia Keys – Empire State of Mind". Discogs. Retrieved April 27, 2010. ↑ The Blueprint 3 liner notes, Atlantic Records (2009). ↑ "Čns Ifpi". International Federation of the Phonographic Industry. Retrieved December 18, 2010. ↑ "Chartverfolgung / Jay-Z & Keys,Alicia / Single". Musicline.de (in German). PHONONET GmbH. Retrieved December 18, 2010. ↑ "Irish Singles Top 50 Issue Date: Thursday September 24, 2009". Irish Recorded Music Association. acharts.us. Retrieved May 4, 2010. ↑ "Luxembourg Digital Songs - January 2, 2010". Billboard. ↑ "Archive Chart". The Official Charts Company. October 24, 2009. Retrieved December 18, 2010. ↑ "Radio 1 - Chart Show — RnB Singles". BBC Online. BBC. ↑ "Jay-Z – Chart history" Billboard Hot 100 for Jay-Z. ↑ "Jay-Z – Chart history" Billboard Adult Pop Songs for Jay-Z. ↑ "Jay-Z – Chart history" Billboard Hot R&B/Hip-Hop Songs for Jay-Z. ↑ "Jay-Z – Chart history" Billboard Hot Rap Songs for Jay-Z. ↑ "Jay-Z – Chart history" Billboard Pop Songs for Jay-Z. ↑ "Jay-Z – Chart history" Billboard Rhythmic Songs for Jay-Z. ↑ "South Korea Gaon International Chart (Week: January 01, 2012 to January 07, 2012)". Gaon Chart. December 15, 2012. Retrieved December 21, 2012. 1 2 "Lescharts.com – Jay-Z + Alicia Keys – Empire State of Mind" (in French). Les classement single. ↑ "ARIA Charts – End Of Year Charts – Top 50 Urban Singles 2009". Australian Recording Industry Association. Retrieved June 6, 2011. ↑ "Dutchcharts.nl - Jaaroverzichten - Single 2009". DutchCharts.nl (in Dutch). Hung Medien. Retrieved June 6, 2011. ↑ "FIMI - Federazione Industria Musicale Italiana - Ricerche e dati di mercato". Federation of the Italian Music Industry. January 19, 2010. Retrieved December 18, 2010. ↑ "Sverigetopplistan - Årslistan 2009 Note: Go to Sök alla listor > Årslistor > Välj år 2009 > Visa!" (in Swedish). Sverigetopplistan. Retrieved May 28, 2011. ↑ "2009 Year End Swiss Singles Chart". SwissCharts.com. Hung Medien. 2009. Retrieved July 16, 2010. ↑ "Hot 100 R&B/Hip-Hop Songs 2009". Billboard. Retrieved July 10, 2011. ↑ "Hot Rap Songs". Billboard. Retrieved July 10, 2011. ↑ "ARIA Charts – End Of Year Charts – Top 100 Singles 2010". Australian Recording Industry Association. Retrieved January 8, 2011. ↑ "ARIA Charts – End Of Year Charts – Top 50 Urban Singles 2010". Australian Recording Industry Association. Retrieved June 6, 2011. ↑ "Austriancharts.nl - Jahreshitparade 2010". AustrianCharts.at. Hung Medien. Retrieved May 30, 2010. ↑ "Ultratop.be - Jaaroverzichten 2010". Ultratop. Hung Medien. Retrieved May 29, 2011. ↑ "Ultratop.be - Rapports Annuels 2010". Ultratop. Hung Medien. Retrieved May 28, 2011. ↑ "Charts Year End: Canadian Hot 100". Billboard. Retrieved May 2, 2010. ↑ "Hitlisten.nu - Track 2010 Top 50" (in Danish). Tracklisten. Archived from the original on September 23, 2010. Retrieved June 4, 2011. ↑ "Dutchcharts.nl - Jaaroverzichten - Single 2010". DutchCharts.nl (in Dutch). Hung Medien. Retrieved January 3, 2011. ↑ "European Hot 100". Billboard. Retrieved December 18, 2010. ↑ "Classement Singles - année 2010". SNEP. Retrieved January 30, 2013. ↑ "Classement Téléchargments Singles - année 2010". SNEP. Retrieved January 30, 2013. ↑ "VIVA Single Jahrescharts 2010". Retrieved June 24, 2011. ↑ "ARCHIVIO RICERCHE E DATI DI MERCATO". Federation of the Italian Music Industry. Retrieved June 6, 2011. ↑ "RIANZ Annual Chart > 2010". Recording Industry Association of New Zealand. Retrieved May 29, 2011. ↑ "Topul celor mai difuzate piese în România în 2010" (in Romanian). România Liberă. Archived from the original on January 6, 2011. Retrieved January 21, 2011. ↑ "Annual South Korea International Chart". Gaon Chart. Retrieved January 21, 2013. ↑ "Sverigetopplistan - Årslistan 2010 Note: Go to Sök alla listor > Årslistor > Välj år 2010 > Visa!". Hitlistan.se (in Swedish). Grammofon Leverantörernas Förening. Retrieved May 28, 2011. ↑ "Hitparade.ch - Schweizer Jahreshitparade 2010". HitParade.ch. Hung Medien. Retrieved June 6, 2011. ↑ "Billboard Year-End 2010 - Hot 100 songs". Billboard. Retrieved December 18, 2010. ↑ "Music Charts, Most Popular Music, Music by Genre & Top Music Charts". Billboard.com. Retrieved August 28, 2011. ↑ "R&B/Hip-Hop Songs: 2010 Year-End Charts". Billboard. December 31, 2010. Retrieved February 11, 2014. ↑ "Rap Songs: 2010 Year-End Charts". Billboard. December 31, 2010. Retrieved February 11, 2014. ↑ "Classement des 100 premiers Singles Fusionnés par GfK Music 2011 - du 1er janvier au 31 décembre 2011" (PDF) (in French). USNEP. Retrieved February 8, 2013. ↑ "SNEP Chart" (PDF). Retrieved February 3, 2013. ↑ "Ultratop.be – GOUD EN PLATINA Singles – 2012". Hung Medien. Retrieved December 22, 2012. ↑ "Gold & Platin". International Federation of the Phonographic Industry. Retrieved June 6, 2011. ↑ "Guld og platin 2010". International Federation of the Phonographic Industry. September 15, 2010. Archived from the original on December 19, 2014. Retrieved January 19, 2011. ↑ "Disques d'or au 31/10/2012" (PDF). Syndicat National de l'Édition Phonographique (SNEP). Retrieved November 9, 2012. ↑ "Bundesverband Musikindustrie: Gold-/Platin-Datenbank". Musikindustrie.de. Retrieved December 7, 2012. ↑ "January 2014 Report" (in Japanese). Recording Industry Association of Japan. Retrieved April 28, 2015. ↑ "Certified Awards". Bpi.co.uk. Retrieved February 11, 2014. ↑ Myers, Justin (October 24, 2014). "Number 1 today in 2009: Alexandra Burke blocks Robbie Williams' comeback". Official Charts Company. Retrieved June 9, 2015. ↑ Grein, Paul (June 4, 2014). "Chart Watch: 'Rude,' 'Summer' Hit Top 10". Yahoo Music. Retrieved July 11, 2015.